A monument commemorates the discovery of tin and the pioneers who settled the district. The monument was unveiled during the 75th anniversary celebrations. Herberton came to importance when, on 19 April 1880, a party of prospectors led by Willie Jack and John Newell discovered tin in the area. They named the settlement Herberton because it was at the headwaters of the Herbert River. In 1882 the two men established a store in Herberton (Jack sold his interest in the mine to John Moffat ) under the banner of `General Merchants and Forwarding and Shipping Agents.` Over the next decade they became the most successful merchants in the area. Eventually there were Jack and Newell stores in Mareeba, Irvinebank, Watsonville, Mount Garnet, Cairns, Port Douglas and a number of other smaller towns. It is important to remember that the discovery of tin at Herberton was largely responsible for the development of the other towns on the Atherton Tablelands. Herberton is to have a Back to Herberton Week this year. Cr. C. Holdcroft, Chairman of the Herberton Shire Council, explained to a public meeting that 1955 would mark Herberton's 75th year. 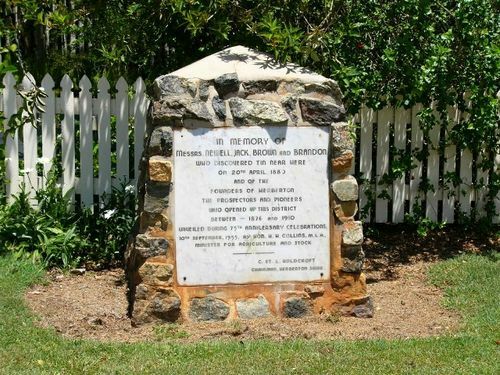 The finding of tin in Herberton was an historic event, at a time when many hardships were endured in opening up the country for settlement in the days when Port Douglas was the main port. Townsville Daily Bulletin (Qld) 13 January 1955. 10th September, 1955 By Hon. H. H. Collins, M.L.A.